Heart rate training is considered to be the most affective way to reach cardio health targets as well weight loss. 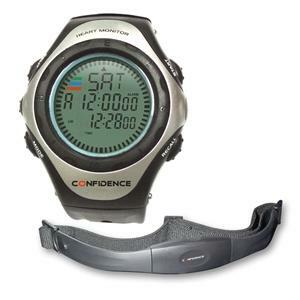 The Confidence Heart Rate Monitor is the ideal accompaninment for any workout or fitness regime, providing accurate readings and an alarm to let you know when you have met your target and to warn against going beyond it. Two row display for split time measurements with 1/100 sec. Tuotteen lisäyspäivä: torstaina 21 tammikuuta 2010.